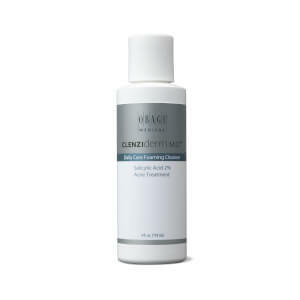 A gel-based facial cleanser that clarifies and prepares your skin for absorption of the system's product ingredients. This concentrated cleaser gently removes excess oil, makeup and other everyday impurities, and rinses clean, leaving your skin feeling fresh and clear. Use twice daily, morning and evening. Massage a small amount of cleanser and lukewarm water onto skin rubbing gently in a circular motion. Rinse completely with lukewarm water and gently pat dry. Water (aqua), sodium laureth sulfate, sodium lauroyl oat amino acids, cocamidopropyl betaine, aloe barbadensis leaf juice (aloe barbadensis), ascorbic acid, glycerin, medicago sativa (alfalfa) extract, borago officinalis extract, chamomilla recutita (matricaria) flower extract (chamomilla recutita extract), sodium chloride, saponins, xanthan gum, phenoxyethanol, methylparaben, ethylparaben, butylparaben, propylparaben, isobutylparaben, fragrance (parfum), red 33 (CI 17200), yellow 5 (CI 19140). I have always loved Obagi products. Especially, the cleansing. This is the first time using the c cleaner. I like it! Best cleanser in the market! Great cleanser with a pleasant fragrance. Does not dry skin or cause redness. Clears minor acne. This is a great product for acne prone skin. I love this cleanser. It cleanses without stripping.